A small 4 by 6 watercolor painting of Koi. 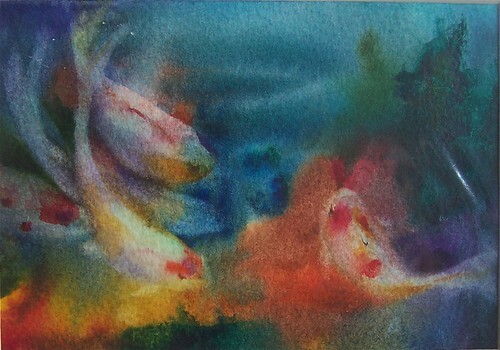 I love the look of fish underwater and I think watercolor captures the look better then any other medium. The white diagonal line on the lower right is actually a reflection and will not be on the final painting. This definately has an Asian feel. This entry was posted in A painting a day, art sales, Postcards, watercolor by shanti marie. Bookmark the permalink. Wonderful use of this medium, watercolor. Mysteriously beautiful. thanks for the kind words, Ana……did you know I have a koi pond? i think indeed that water color captures the color and movement of koi. This painting is exceptional. This needs to be a bigger size. You could get alot for this painting if it was larger.